Garden of Aaron: Oh the Dreadful Wind and Rain! Oh the Dreadful Wind and Rain! It was a particularly wet and windy spring at the Garden of Aaron. But wind is a familiar them in my garden. In the winter, there's the bone-chilling wind out of the Northwest. In the summer, we sometimes face a hot and dry wind out of the South that can stress and crisp even those plants that are supposedly heat and drought tolerant. So my question to all you expert gardeners out there is this: In your experience, which plants are best suited for a windy garden? I'm interested in all suggestions, including annuals and perennials, but I'm most interested in shrubs and trees, particularly those I might be able to use to construct some sort of windbreaks to protect the less wind-tolerant plants from the harsh winds of fate (and Mother Nature). "Natchez" Crape Myrtle stands strong against the winds that rip across our hilltop garden. 1. Crape Myrtle (Lagerstroemia indica) shows up on lists of wind-tolerant plants. (Here's one list, here's another.) I agree - to a point. The branches are very good at bending rather than breaking in gale-force winds and the leaves seem tougher than say maple or redbud (see below). But the leaves do get awfully tattered - especially if the winds hit right when new foliage is emerging. I don't expect leaves to look pristine at the end of a growing season, but crape myrtle leaves can get ripped up by the wind and chewed up by insects to the point where they seem shredded fairly early in the season. 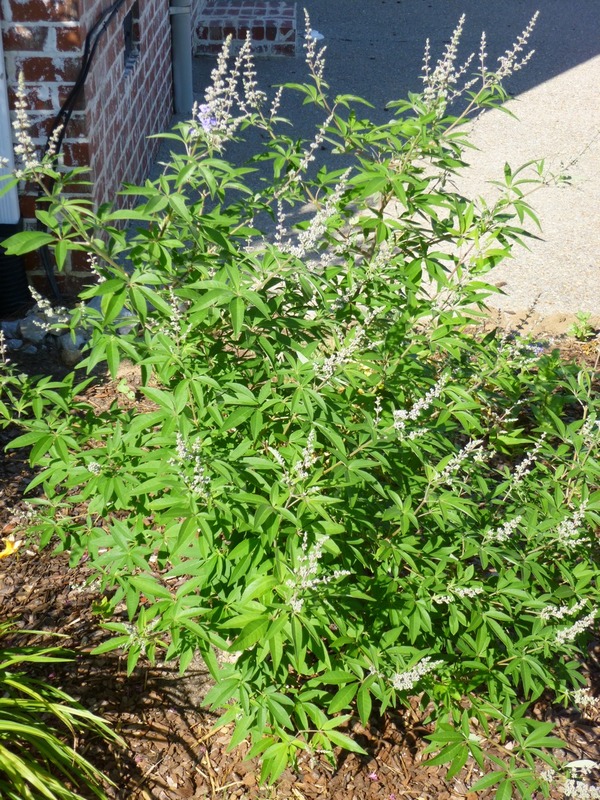 Vitex agnus-castus flowers just starting to bloom. Note how clean and fresh the foliage looks despite the fact that the plant is sited on a windy, hot, full sun corner next to the garage and a baking concrete driveway. Vitex seems cool as a cucumber and perfectly at home. 2. Vitex agnus-Castus (a.k.a. 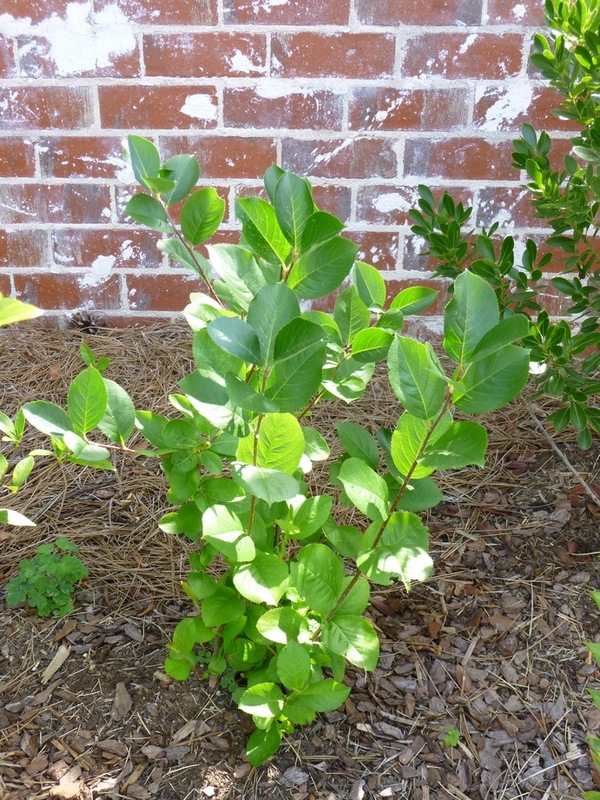 Chaste Tree) made it onto a list published by the Houston Chronicle of trees most likely to survive a hurricane. I'd call that wind-tolerant. 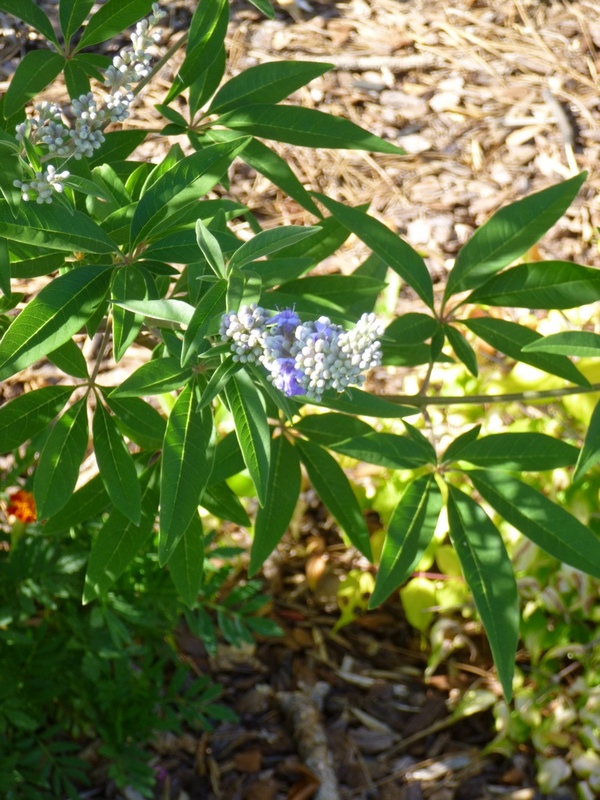 (Crape Myrtle was on the list too...) I've got to say, I've got our Vitex right at the corner of our house where it can buffeted by both Northern and Southern winds. So far, it's looking good. I think there was some minimal branch breakage from winter storms, but the spring and summer winds haven't fazed it and the foliage is looking good - clean and fresh, with no signs of stress and hardly any signs of insect predation. 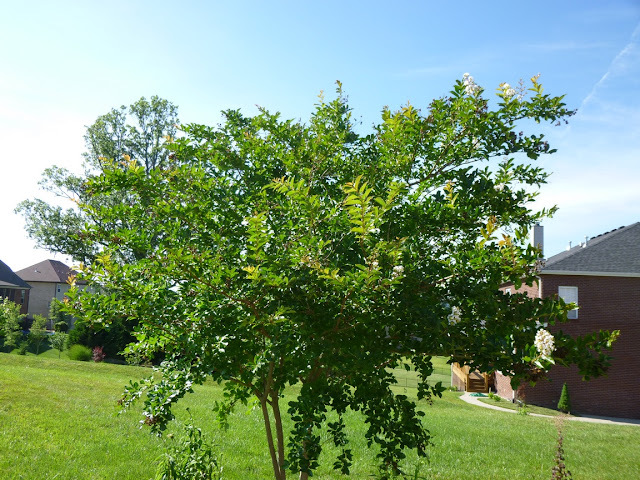 I've read comparisons of Vitex vs. Crape Myrtles where people say that Crapes have a denser canopy and are thus better for providing privacy, but I have to say that our young Vitex actually seems far denser than our young Crape Myrtles. Maybe the Vitex canopy opens up more as the tree gets older? Overall form of young Vitex agnus-castus tree/shrub planted last autumn. Foliage seems relatively dense at this point despite comments to the contrary on the World Wide Web. Here's a young "Petite Snow" crape myrtle, also planted last autumn at the same time as the Vitex. I'd say the foliage on this is actually much less dense than the Vitex foliage. Also, the Vitex is covered with buds and blooms in its first full year in the garden, whereas there was nary a bud or flower in sight on this crape myrtle in mid-June. 3. Maples and Redbuds both seem stressed by our hot dry winds. 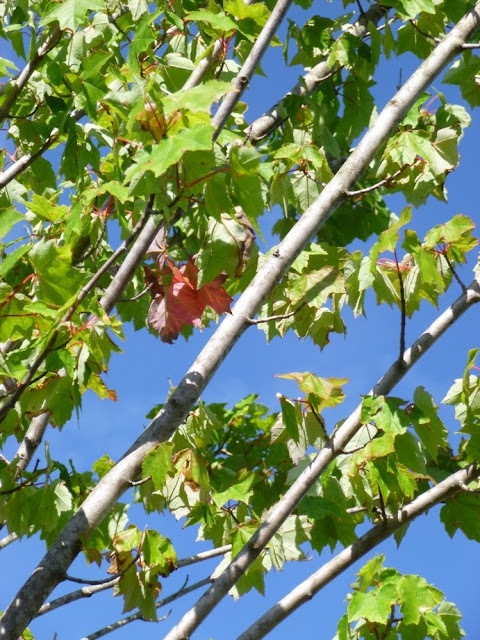 In fact, I had two young maples die on me last year. For some reason, I still let myself get talked into planting two new maples in our front yard. Neither of them looks happy in the hot winds of summer. In fact, despite lots of water, some of the leaves are turning color, which I know is not a good sign. The redbuds look slightly more wind-tolerant, but their leaves hang awfully limp when it gets hot, almost like they're panting in the heat. Maple leaves looking stressed. Never a good sign when your maple leaves are changing color in July. 4. Juniperus virginiana, Eastern Red Cedar also shows up on lists of plants suitable for windbreaks. 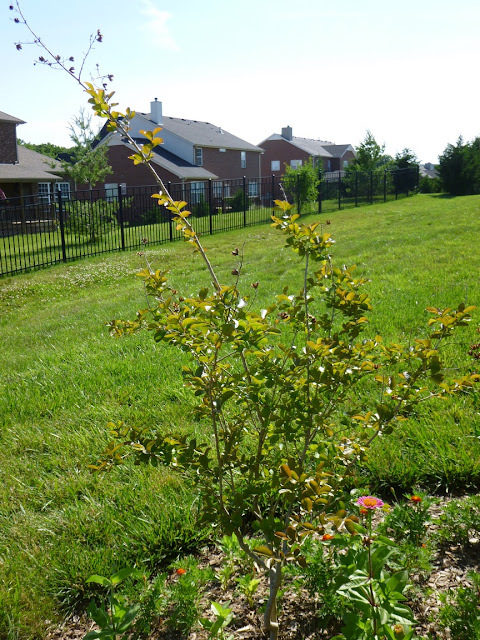 http://plants.usda.gov/factsheet/pdf/fs_juvi.pdf Our landscaper planted three of these on the hill. They're not looking all that great, but I think that's due less to the wind and more to the fact that we wanted large trees for instant landscape effect but we ended up with sort of small root balls on those trees. Not a good combo. In general, I feel I learned from this past winter that it's probably better to start with smaller trees that would probably be less-stressed by the transplant process. Anyway, I'm not in love with the Eastern Red Cedars. Probably because I find it hard to get too excited about most conifers. But I have to admit that they do seem to be fairly wind-tolerant. 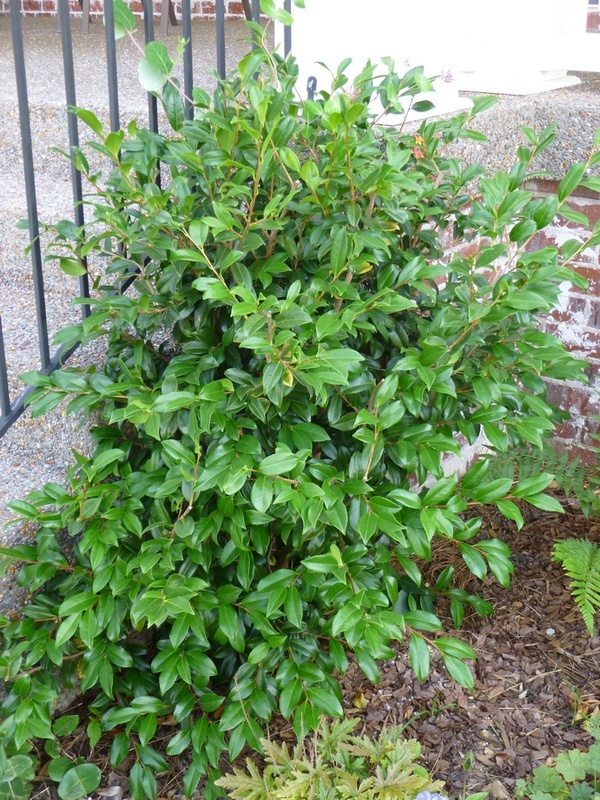 The shiny and waxy leaves of Camellia sasanqua seem wind-tolerant. 5. Camellias - I don't think most people would think of camellias as being tough plants, but apparently they are surprisingly drought-tolerant and even recommended for windbreaks. Our camellias are in somewhat sheltered settings, but I have to say that they have not seemed fazed at all by last year's heat/drought or by any of the winds that whip around the house. I'm thinking more and more about incorporating these into my windbreak and screening plans. The only problem that I can see is that they don't necessarily grow all that fast in my experience, especially when they are young. So if I plant a small tree - one that would be less likely to suffer transplant shock - it might take a long time to grow to the height and density where it would really help block the wind and provide privacy. And here are some other shrubs and trees that I'm considering adding to the garden / landscape. Any thoughts based on experiences in your own gardens and/or visits to other gardens on whether any/all of these would be wind-tolerant and/or suitable for windbreaks? 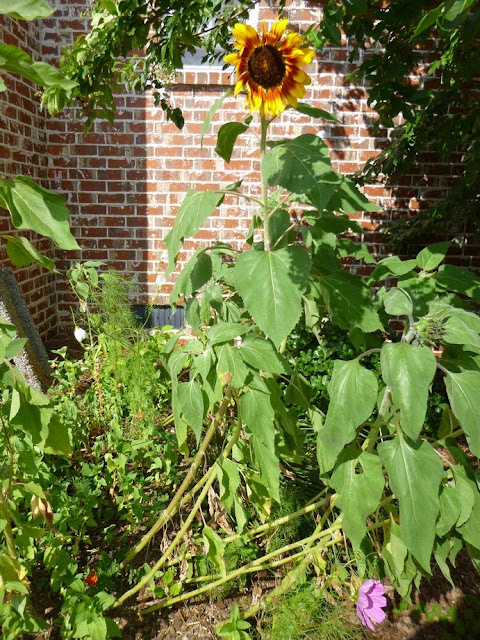 As for smaller plants, I've found that high winds will bend sunflowers (although they'll usually keep growing), topple cosmos (although they'll often keep growing too) and break plants like Caryopteris and Coneflower. (To qualify that, most of the coneflowers survived the wind storm and look none the worse for wear, but I did lose a couple.) I lost one stem on Hibiscus moscheutos too, but the rest of the plant seems fine. Callicarpa americana, American Beautyberry. I'd call this an open, lanky shrub (at least in its youth). 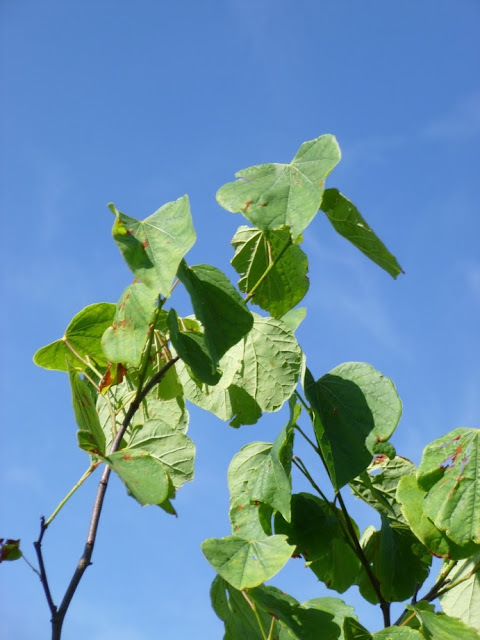 The leaves will get burnt by strong, hot winds. 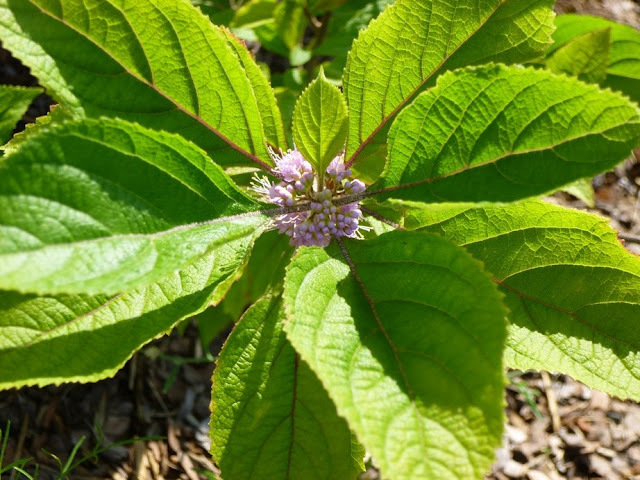 Despite glowing reviews from some online reviewers, I can not recommend Beautyberry for your garden. Beautyberry (Callicarpa americana) also seems much happier this year now that I've moved it away from a windy spot to a somewhat sheltered area. So...what are your most wind-tolerant annuals, perennials, shrubs and trees? And which are the ones that are pushovers (literally) when it comes to getting blown around by the winds? My dream is to look out the window and not feel that my plants (like the maples and redbuds) are getting tortured by the winds. I'd love to find plants - especially shrubs and small trees - that are wind-tolerant. Heck, I'd like to find plants that revel in getting their leaves ruffled about by the wind. I want to find plants that look as though they're tossing their branches like a model tosses her hair back for a photo shoot or a walk down the runway. And hopefully these stalwart windbreak plants will help reduce the howling gales to manageable breezes so that I can grow more tender waifs in the sheltered microclimate they create. Floral Fireworks for July 4th!